There's a whole heap of excitement brewing at Fiddlers Green Amphitheatre, as preparations take place for the annual KS 107.5 Summer Jam on Sunday 19th August 2018! 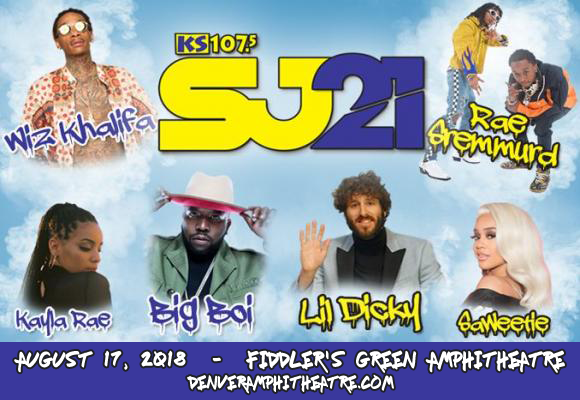 Summer Jam turns 21 this year and with an all-star line-up of Wiz Khalifa, Rae Sremmurd, Lil Dicky, Big Boi, Lil Skies, Saweetie and more, KS 107.5 have done it again – bringing you the hottest hip hop show of the summer! Best known for his hit singles “Say Yeah” and “Black and Yellow”, Wiz Khalifa is an American rapper, songwriter and actor whose career began in 2005 with the release of his first mixtape, Prince of the City: Welcome to Pistolvania. His debut album, Show and Prove (2006), lead to Khalifa signing with Warner Bros. Records the following year. After a three year stint with the label, Khlifa moved to Atlantic Records, which sparked his breakthrough into mainstream popularity. His first album for the label, Rolling Papers (2011), debuted at number two on the US Billboard 200. Khalifa's 2015 track "See You Again" – a tribute to actor Paul Walker recorded for the soundtrack of the film Furious 7 – peaked at number one on the Billboard Hot 100 for 12 non-consecutive weeks, becoming his biggest hit to date. His hotly anticipated follow-up to Rolling Papers, Rolling Papers 2, is slated for a 2018 release.